Fill in the blank: The 2017 regular season's first ejection will involve Umpire ____ and Manager ____. Lock in your predictions before Opening Day. Welcome to the UEFL's pre-season Prop Predictions, a chance to earn extra points in the UEFL standings. As stated in UEFL Rule 4-6, Prop predictions are forecasts of what might occur during an upcoming season, series or game. They may be numerical (e.g., "On what date will the first ejection of the MLB season occur?") or objective (e.g., "What umpire will finish the season with exactly 10 ejections?"). The following 10 questions serve as this year's prop bets ahead of the regular season. Submit your predictions via the accompanying form (available via "Read More" / scroll down) prior to Opening Day (before April 2) to lock in your picks. Predictions filed after 12:01 AM on April 2, 2017 will not be accepted. Prop 3) The first regular season ejection of 2017 will occur on what date? Prop 4) The FIFTH person ejected in 2017 will be from which Division? Prop 5) Umpire Joe West's first Managerial ejection of 2017 will be of what person? Prop 6) The first 2017 regular season ejection for FIGHTING will occur on what date? Prop 7) Manager Joe Maddon's first ejection of 2017 will occur on what date? Prop 9) The THIRD regular season ejection of 2017 will be credited to which crew chief? 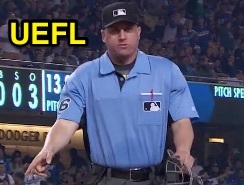 Prop 10) Of the four new full-time umpires, which one will execute the earliest ejection? > Tiebreaker 1: Whichever game's scheduled first pitch occurred first. > Tiebreaker 2: Whichever ejection occurred during an earlier half inning of the respective game. > Tiebreaker 3: Whichever ejection occurred with fewer outs during said half inning. > Tiebreaker 4: Whichever ejection occurred during an earlier at-bat (e.g., batter 1 vs 2 of the inning). > Tiebreaker 5: Whichever umpire or team person, as applicable, has fewer seasonal games ("G"). > Tiebreaker 6: Whichever umpire or player/manager, as applicable, has more career games worked. The 2017 pre-season prop board form is embedded below (Alternate Link: Click here).